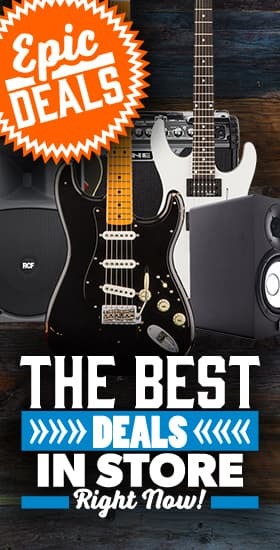 Peavey - Andertons Music Co.
Peavey are a long-standing company, building amplifiers, instruments and pro audio equipment. For over 50 years, they have served the music industry with great-sounding, reliable gear, and continue to develop and refine their many product ranges. With many respected players using their gear, they are most known for their legendary amplifiers. With their 5150 and 6505 amp heads becoming notorious in the metal scene, Peavey were also responsible for the game-changing Bandit solid-state range. Renowned modern guitarists such as Simon Neil (Biffy Clyro), Rob Flynn (Machine Head) and Corey Beaulieu (Trivium) are on Peavey’s roster, proving that their appeal is as strong as ever! Founded in 1965 by Hartley Peavey, the company has become one of the largest providers of pro audio equipment in the world. Harkening from Mississippi in the US, Peavey had humble beginnings, with Hartley building his first amplifiers from his basement in the 50s. Now owning multiple plants across three continents, Peavey are a powerhouse in the musical equipment industry. Peavey hit their stride in the 80s, when they unveiled the Bandit series of guitar amplifiers. As some of the first mass-produced solid-state amps available, they were renowned for providing great tone at an affordable price-point. Popular amongst beginners, even professionals admired their tube-like tonality and bullet-proof reliability on the road. Over thirty years later, this legendary line is still going strong. In the early 90s, Peavey teamed up with the renowned Eddie Van Halen to build a signature amplifier. This spawned the iconic 5150 amp head, becoming one of the most used amplifiers in the hard rock and metal genres. These amplifiers were loved for their saturated and focused high-gain tones, and have been heard on countless metal records. In the 21st Century, Peavey offer more choice than ever. With a number of amplifier lines, the company also boast their own instruments, as well as live/recording gear. No longer owning the rights to the 5150 name, Peavey succeeded this fabled design with the 6505 and 6534 amplifiers. Delivering fire-breathing high-gain, with excellent presence and bite, these amps are used by some of the biggest metalheads in the business. Peavey’s ValveKing range gained notoriety for providing genuine valve amp tones at an attainable price. Still available, these amps are adored for their versatility, capable of producing sparkly cleans to powerful distortion. To keep up with brands that offered inexpensive digital amps, Peavey expanded their solid-state range with the Vypyr series. Unlike the Bandits, these intuitive amps were packed full of effects, also capable of emulating various famous amps. Their bass amps include the Mini line, huge-sounding 500W and 1000W amp heads packaged in tiny, portable enclosures.